In his first State of the Union address, President Donald Trump nodded to the catastrophic storms and wildfires that killed more than 300 Americans and caused a record $306 billion in damages. Yet he made no mention of the planetary warming ― 2017 was the second-hottest year on record ― that worsened the disasters, instead bolstering his administration’s aggressive fossil fuel push. The White House made slashing environmental regulations a cornerstone of its agenda over the past year, going as far as to purge government websites of climate data and remove issues like sea-level rise from the administration’s list of security threats. The deregulatory assault came as Trump aggressively aimed to increase fossil fuel production and use. The speech put a glossy finish on the president’s so-called “energy dominance” agenda, as the United States is poised this year to surpass Saudi Arabia and Russia as the largest oil producer. In reality, the U.S. remains a steady importer of crude oil, and likely won’t become a net exporter of energy until the 2020s, according to a forecast this month by the U.S. Energy Information Administration. 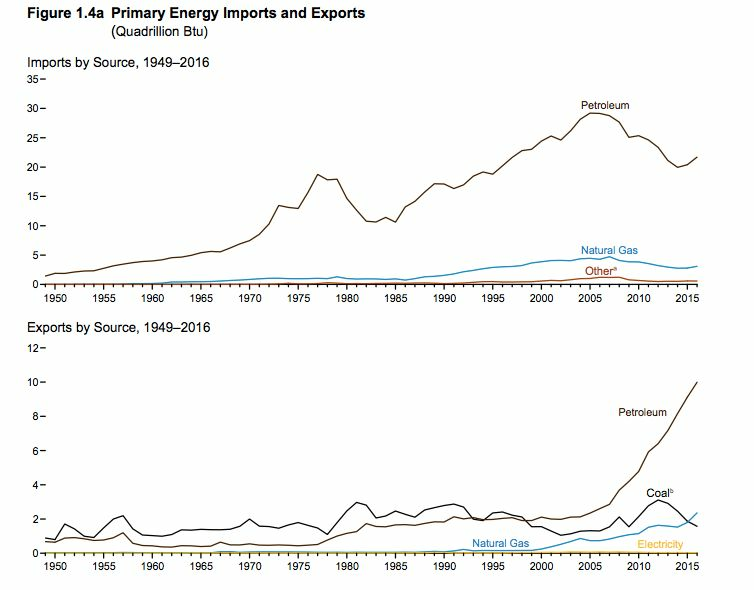 Exports, driven by the boom in shale oil brought on by the rise of hydraulic fracturing, surged under former President Barack Obama. “We have ended the war on American Energy and we have ended the war on beautiful, clean coal,” he said. But the revival fell flat compared to his promises. Coal production and exports increased slightly, but coal-fired plant closures continued apace. Trump has repeatedly portrayed himself as the coal industry’s savior, but the federal agency that controls energy infrastructure rejected the administration’s only plan to subsidize coal plants earlier this month. The Washington Post this month debunked the president’s claims about helping coal miners and stoking demand for fuel, and gave the president three and four “Pinocchios” for his statements on those topics, indicating that they were highly inaccurate. “Clean coal,” meanwhile, remains an oxymoronic myth as experimental projects to capture and contain carbon dioxide emissions at coal-burning plants continue to fail or prove to expensive. Along with boosting America’s production of fossil fuels, Trump vowed — as he has before — to rebuild America’s crumbling roads, airports and bridges. But he offered few details about how he plans to pay for it. “I am asking both parties to come together to give us the safe, fast, reliable, and modern infrastructure our economy needs and our people deserve,” Trump said. Trump is expected to proposed infrastructure plans that could make it easier to obtain building permits. The fossil fuel industry ― especially pipeline builders ― could gain the most from the potential change, but renewable energy producers could also benefit. “That may not please environmentalists, but it’s important not to necessarily conflate the clean-energy industry with the environmental community,” Zindler said before the speech. A leaked White House document, which Politico and Axios obtained last week, suggested the government would look to sell off, trade or transfer federal assets, including land, to help pay for infrastructure projects. It also outlined the administration’s plans to use mineral and energy revenues to pay for such improvements. Paul Teller, a special assistant to the president for legislative affairs, told Politico the memo does not reflect the final proposal. A spokeswoman for Interior Secretary Ryan Zinke also dismissed reports that public land is on the table. “The Secretary’s position is unchanged,” she told the Missoulian. Both Zinke and Trump have repeatedly said they oppose selling off or transferring control of federal lands. Adding to environmentalists’ worries, The Washington Post reported Friday on a second leaked draft document suggesting the White House aims to scale back environmental requirements to simplify and fast-track its infrastructure efforts. The plan would require government agencies to adhere to strict environmental review deadlines and limit certain agencies’ abilities to prevent projects from moving forward. In a call with reporters ahead of Trump’s speech, representatives from several environmental groups slammed the White House proposal. “It’s a scam that will gut or significantly change at least 10 bedrock environmental laws to make it easier for corporations to bypass critical protections for air, water and wildlife,” said Christy Goldfuss, senior vice president for energy and environment policy at the Center for American Progress.